Saturday, July 4th, 2009 | 10:06 am	and filed in Propellerhead. 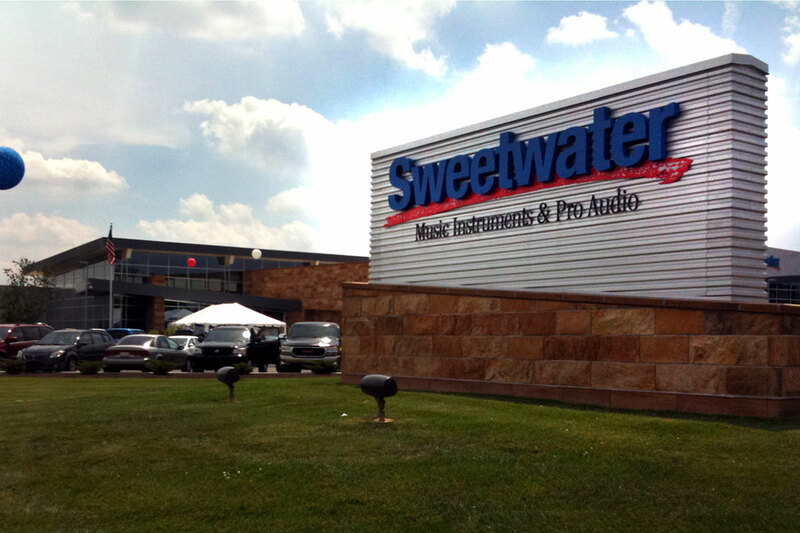 Last weekend, I had the opportunity to visit the Sweetwater Campus in Fort Wayne, Indiana. The company is celebrating their 30th year in the music business, making this years Gearfest a special occasion. The facility is quite impressive and has several recording studios and an auditorium. Naturally, these rooms are fully outfitted with just about every piece of contemporary equipment. There’s also a retail store, cafeteria, and balcony where you can stand and look down on the massive warehouse storing all of the equipment in their catalog. The people in Fort Wayne are really nice. I encountered a few travel snafus, and people went out of their way to help me out. The staff at Sweetwater were equally as hospitable, and did everything possible to make people comfortable in the heat. If you’ve ever dealt with Sweetwater over the phone, you probably know how friendly and helpful, they are. I can confirm that they are no different in person. Being there in an official capacity representing Propellerheads and Line6, left me with little time to listen to the presentations in the auditorium, but I had the nice chance to visit with neighboring vendors, Mark of the Unicorn and Solid State Logic. I was talking to Dave Roberts from MOTU about Volta and showed him my Reason to CV/Gate patches, and I found out that the 896mk3 does not have DC coupled outputs, so it’s not compatible with volta or my Reason CV/Gate configs. However, the 896HD is compatible. Out of their entire current product line, the Ultralite mk3 with 10 analog outputs seems like the best deal. I also had the chance to play with audio stems from Peter Gabriel’s Sledgehammer running through the SSL XLogic workstation. Fadi Hayek was demonstrating their XLogic Alpha-Link MADI interface system with 128 audio channel capacity over fiber optic lines and extremely low latency (32 samples!) Here’s a link to a video on facebook. Thanks to everyone who came out to see us. It was great meeting fellow Reason users who travelled from all over: Michigan, Illinois, Missouri, Kentucky, Ohio, and of course, Indiana.